The study hypothesis was that pre-slaughter handling is not conducted in such a way that pigs can be considered humanely slaughtered, nor is it conducive to promoting those properties of fresh meat that could enhance pork quality. The 1st phase of the investigation was aimed at confirming the present compliance level within the prescribed norms. To this end the importance of stunning induction requirements for effective electrical stunning, the welfare implications relating to the pre-slaughter handling of pigs and the stunning and sticking techniques were investigated. Pre-slaughter welfare of the pigs at the abattoir was found to be influenced at the outset by the origin and type of pig slaughtered, the daily throughput range of pigs and the type of abattoir involved. A disappointing pre-arrival aspect was that deficiencies in road motor vehicles were observed while off-loading pigs. Through poor design or lack of maintenance, another factor that hampered free movement of pigs was the off-loading facilities. The nature of animal behaviour in the pens, in the passages and when going into the stunning area was directly related to the pig handling efficiency and to the nature and extent of design and maintenance problems with equipment. None of the abattoirs had a well designed in-feed to a well planned stunning area/facility, and a very high level of pig pre-slaughter stress prevailed. The optimum position of the electrodes is virtually impossible to attain under practical conditions and the practice of repeat application of electrical stunning is common. Of the total sample size (n = 1175), 34 % were difficult to shackle, 90 % of these being from the abattoirs tending to slaughter more routinely a wide range of different sized pigs. In this survey 149 pigs (13 %) required more than a single sticking attempt to bleed out properly, considerably higher than in other published reports. Keywords: compliance level, Highveld region (South Africa), pig electrical stunning, structured questionnaire survey, welfare aspects. The Meat Safety Act (Act No. 40 of 2000, Government Gazette Notice 1106, Republic of South Africa) stipulates as an essential national standard that an animal presented for slaughter at an abattoir must be handled humanely during loading, transportation, off-loading, housing, immobilising and killing as prescribed in accordance with the requirements of the Animals Protection Act 1962 (Act No. 71 of 1962)10. The Red Meat Regulations under the Meat Safety Act stipulate inter alia that for stunning an electrical stunning apparatus must be provided and that the operational parameters for stunning must be displayed on the stunning apparatus or in the stunning area. An electrical stunning apparatus must be in a good state of repair and used in accordance with approved methods. The terminals must be applied to the head in such a manner that the current passes through the brain. Meters must be provided to monitor the voltage, amperage and time used during stunning to assure that the manufacturers recommendations are adhered to11. In the United Kingdom legislation requires the production of immediate insensibility, implying that a stun can be applied only once9,17 and many countries require pigs to be rendered unconscious and insensible to pain prior to bleed out to be considered humanely slaughtered6. Electrical stunning induces unconsciousness by generating an epileptiform seizure, characterised by 2 distinct phases, a tonic phase and a clonic phase, rendering the animal insensible to pain. This seizure is dependent upon the amount of current passing through the brain and possibly the area of the brain through which current flows6,8. Electrical stunning reduces inhibitory influences of the brain on the spinal cord and can lead to kicking during the clonic phase, resulting in pigs being more difficult to shackle and stick effectively and impairing worker safety6. The impedance of a live pig's head is predominantly a function of the stunning voltage and decreases non-linearly with increasing voltage. Tissue reactance was not found to be a contributing factor, but the application of high stun voltage was found to cause a breakdown in the tissue impedance between the electrodes, which continued to decrease with stun duration17. Minimum current levels required for effective electrical stunning of pigs are higher than those obtainable with low voltage systems5,7. Better tong placement will result in reduced contact impedance and improves the performance of the stunning system13. Modern hand-held tong design for high voltage systems led to the development of dry electrodes with sharp, teeth-like contacts that in most circumstances penetrate the skin. Electrical current will flow between the electrodes dependant upon a number of compounding factors, which change the values of the impedance pathways taken by the current field and affect both current amplitude and the 3-dimensional spread of the current field. The frequency and waveform of the stunning current will directly affect impedance13. Several methods have been described to apply the electrodes used with an electrical stunning apparatus, including headonly, head-to-back and head-to-brisket application of electrodes6. The use of tong-type electrodes for effective headonly electrical stunning of pigs requires good tong positions that span the brain, namely between the eye and ear on each side of the head, below the ear on each side of the head, or diagonal application between the top and bottom of the head6,13. Poor tong placement could result in poor electrical contact, electrodes that do not span the brain, an inadequate stun and hence poor animal welfare at stunning when used at 150 to 250 V2,13. The minimum European Community requirement for electrical stunning of pigs is a current of 1.25-1.3 Amps maintained for at least 3 seconds and the voltage applied to achieve this current must be at least 240 V7. A maximum stunning to exsanguination interval of 15 seconds was considered sufficient to ensure that pigs of 60-80 kg do not regain consciousness following the stun5. The head-to-back or head-to-brisket stunning method was also considered the most humane as it induces cardiac fibrillation resulting in immediate cardiac arrest18. Pigs generally exhibit less kicking18, improving worker safety and allowing carcasses to be more easily handled compared with pigs stunned using head-only tongs. Cardiac fibrillation also eliminates the risk of pigs regaining consciousness prior to exsanguination that can occur due to variation in stun to stick intervals when head only tongs are used. Headto-back stunning of pigs may result in broken vertebrae if the voltage applied is too high6. Variations in current levels due to different tong applications have previously been shown not to affect intensity of convulsions2. Although there is no clear explanation for the individual differences in the intensity of convulsions, different waveforms and frequencies can modify the characteristics of post-stun convulsions and affect quality4. A solution, from a welfare standpoint, would be to reconsider head-to-back stunning (cardiac arrest) which prevents carcass convulsions. However, occurrence of vertebral fractures, a common practical problem with manual application of this method, needs to be eliminated18. Some modern but expensive automatic stunning systems that use appropriate waveforms and frequencies to 1st induce a stun followed by cardiac arrest already provide welfare and quality assurance. Another important factor to bear in mind is that the insensibility provided by head-only electrical stunning is reversible, unless the heart is stopped by cardiac fibrillation, and recovery could take place before exsanguination is complete. No published data could be found in South Africa proving that the pre-slaughter handling of pigs is humane and that it is conducive to enhancing pork quality. The primary objective of this research was to foster a better understanding of the importance of the welfare implications relating to the pre-slaughter handling of pigs, stunning induction requirements for effective electrical stunning, and the stunning and sticking techniques. Experimental design required a visit to 6 pig abattoirs, once in summer and once in winter during normal slaughter operations to analyse predetermined aspects relating to the pre-slaughter handling of the pigs through consultation with the management and by personal observation, measurement and data capture on identified operating procedures. Observations were made over the course of 1 slaughter day for each visit and involved 100 pigs per abattoir visited. The understanding of the purpose of the research, the content of the questionnaire and the practicality of the data capture envisaged was confirmed by a pilot study. A structured questionnaire interview was conducted with the processing management of each abattoir to obtain basic information about the abattoir, average throughput details, breed/s slaughtered, maximum, minimum and modal dressed mass and modal classification details. Lairage care aspects were also investigated, including lairage design, pen sizes and cooling systems, management of lots on arrival, the method of identification of individual pigs, the means of herding pigs and staff training programmes. The handling of the pigs was also related to meat quality factors with information gleaned on the resting period: direct slaughter of pigs (30 minutes in pens) or resting periods up to 2-3 hours and the stress factors immediately before slaughter. Technical information was obtained on the electrical stunning apparatus and the standard operating procedure (SOP) prescribed for the stunning of pigs at the plant. In this regard discussion centred on the stunning area (pen, crate, restrainer or crowding pen), the type of stunner (tongs, V-apparatus or automatic) and electrode factors (design, condition and maintenance). In respect of current South African legislation, it was ascertained whether or not the operational parameters for stunning were displayed on the stunning apparatus or in the stunning area and whether the electrical stunning apparatus was maintained in a good state of repair and was used in accordance with approved methods and the manufacturer's recommendations. In addition, it was ascertained whether the terminals are applied to the head of the animal in such a manner that the current passes through the brain, and whether meters are provided to monitor the voltage, amperage and time used during stunning. This was followed by personal observation of predetermined criteria relating to the pre-slaughter welfare of the pigs and during which interview data were confirmed. Pre-arrival aspects recorded were the distance travelled and the type and condition of the transport vehicle. As an additional lairage care aspect, environmental conditions were recorded on the date of each visit including the time of day, climatic conditions and the temperature of the lairage. The layout of the pens and the races and passage design were described. Staff handling efficiency was assessed as good, trained and sympathetic, ignorant (not knowing what to do), inexperienced (knowing what to do but not knowing how to do it), incompetent (inability to do it) or inconsiderate (not caring). The method of herding pigs (use of prodders, bag whips, noise levels, hand herding and boards) was assessed and recorded. The behaviour was scored according to a 4-point scale when the pigs were moved from the lairage to the stunning pen, and ranged from very quiet, no resistance and moving freely to refusing to move and very excited. Fighting was interpreted as pigs attacking each other for longer than 10 seconds. In respect of stunning induction requirements, the method and site of application of the electrodes were recorded as head only between the eyes, head only poll/neck, head-to-back or head-tobrisket, or any observed combination. Details of current amperage range, duration of application in seconds and voltage applied were recorded as well as the slaughter throughput rate per hour. The site and ease of shackling the pig was observed and assessed on the scale no delay (immediate and easy), minimal delay, some delay and physical control required (pinning down with a foot), difficult with considerable delay or an excessive delay (almost impossible). The physical responses and reflex behaviour of each pig at the time of sticking (convulsions normal or excessive) and the ease and adequacy of each sticking operation was examined, assessed and recorded under 5 categories. These were optimal (no contractions or only tonic), incidental contractions (tonic followed by slight clonic contractions), tonic and severe clonic contractions and delayed operation, adversely affected by severe convulsions/contractions (kicking) or a totally unmanageable sticking operation. The effectiveness of sticking based on the experience and care of the operative in charge of the slaughter procedure was assessed as successful 1st attempt at sticking - pig lying or pig hanging, subsequent attempts required for a rapid and profuse loss of blood or pigs showing signs of recovery (return of rhythmic breathing). The time in seconds between stunning and bleeding was recorded as was the duration of the bleed out time and the stick wound was assessed as small, medium or large.  Two were multi-species abattoirs with a daily throughput range for pigs of 350-850 (averaging 600).  Two were large specialist pig abattoirs with a daily throughput range of 620-1200 (averaging 900).  Two were smaller specialist pig abattoirs with a daily throughput range of 300-450 (averaging 375).  All slaughtered a mixture of breeds, but with the large specialist pig abattoirs tending to slaughter a more uniformly sized pig dressing out as bacon pigs (mass 75-90 kg) or large porkers - mainly Topigs and PIC genetics.  The multi-species service abattoirs and the smallest specialist pig abattoir tended to slaughter more routinely a full spectrum of sizes from both intensively and extensively raised pigs. The dressed mass ranged therefore from 10 kg (seasonal, suckling pigs) to sow culls at 200+ kg to boars (maximum dressed mass recorded 347 kg).  Classification of mainly P and O, with P up to 90 % was reported from specialist pig abattoirs but an example range of P: 45 %, O: 35 %, R: 15 % and C: 5 % and lower, was not uncommon from service abattoirs. The carcase classification is based on warm dressed carcase back fat thickness and lean meat percentage (LMP) using either the manual intrascope or the computerised Hennesy probe reading. PORCUS is the acronym used by the local pork industry with a P classification based on a LMP above 70 %. This drops in 2 percentage point steps through the letters O, R, C, U to S at a LMP reading below 62 %.  Of the vehicles used, 50 % were singlebed vehicles, including 4 1-ton utility vehicles ('bakkies'), 41 % double-deck side off-loaders and 9 % were tractor-drawn single-bed rear off-loading trailers.  No shade cloths were used in 59 % of the vehicles and 50 % of the 14 trailers.  Floor cleats, grids or mats were not used in 55 % of the vehicles.  Problems were encountered in 75 % of double-deck side off-loaders - mainly from the lower deck and 20 % of singlebed side off-loaders.  A low single level concrete ramp, poorly placed for larger side off-loader vehicles and trailers to dock correctly and unable to adjust to multiple-deck vehicle heights.  A limited turning circle to allow vehicles and trailers to dock correctly.  Ramps, fixed or adjustable, too steep and slippery, even when fitted with grids.  Through poor design or lack of maintenance, other factors that hamper free movement of pigs, for example, slippery floor surfaces, sharp corners and open-sided landing areas or ramps. Weather conditions recorded were variable with winter temperatures ranging from 8 ºC to 18 ºC and summer more consistently from 24 ºC to 26 ºC, but the environmental temperature of the lairages was lower than that of the prevailing ambient temperature. Lairage capacity was generally based on a pen size using a sliding scale formula with 18 m2 holding up to 25 bacon pigs, 36 porkers and 12 sausage pigs. In 4 of the 6 abattoirs visited identification of pigs was by means of slap tattoo on arrival and records kept of subsequent pen allocation. In the other 2 cases involving service abattoirs, pigs were individually and lot number tagged and records kept. Vehicle lots were accommodated according to vehicle loads without lot mixing. In all the abattoirs the herding of pigs was achieved using bag whips, making a noise or by hand herding - coins or stones in a plastic bottle made an excellent rattle. Staff handling efficiency was measured against the published category criteria described above. The nature of animal behaviour in the pens, in the passages and when going into the stunning area was directly related to the pig handling efficiency and to the nature and extent of design and maintenance problems with equipment. The policy adopted for a stand-over time prior to slaughter for the pigs in the lairages was very similar in 4 of the abattoirs visited, namely, slaughter on day of arrival after a 1 hour resting period for every 1 hour of travel to the abattoir, with up to 100 pigs held over for slaughter the next day. The other abattoirs adopted a more flexible policy ranging from slaughter on arrival to a stand-over as long as 48 hours in the lairage. In the main, however, pigs were rested for 1-2 hours prior to slaughter. In all but 1 of the abattoirs the stunner was a hand-held V design with an activating button and smooth electrodes ±100 mm on each side attached to the control box and the unit was custom designed and supplied by 1 company. One abattoir had an automatic hydraulically operated and computerised copper fibre mace electrode catching pigs on each side on the lateral aspect of head. No abattoir had operational parameters for stunning displayed on the stunning apparatus or in the stunning area. The terminals (electrodes) were mainly applied in the region of head only behind the ears with a tendency to below the ears from in front - good tong positions spanning the brain below the ear on each side of the head. The stun duration varied according to size and ranged between 2 and 15 seconds. Insensibility ranged from optimal to a majority of typical tonic/ clonic contractions. For the current details of stunning induction the researchers were informed that the amperage ranged from 0.5 to 1.6 except for the high voltage automated stunner at 500 V, where 15 amps were generated for a very short time. The low voltage used in the other abattoirs ranged from 90 to 230 V. Physical responses post-stunning were tonic/clonic contractions of varying severity (Table 3). The most poorly performed, variable and disappointing function was the shackling of pigs, mainly in the 2 service abattoirs. The sticking operation and bleed out was, however, well done in all but 1 of the abattoirs, with a strong tendency towards making a medium-sized stick wound. 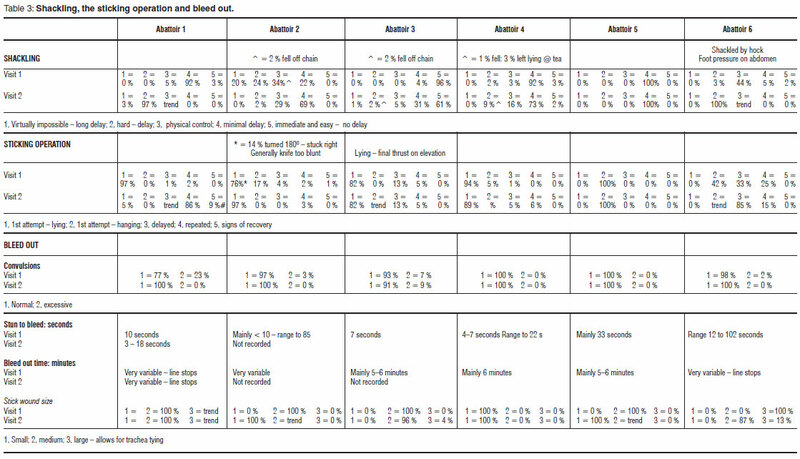 The time from stunning to bleed out was mainly within 10-12 seconds and the duration of the bleed, although variable, was seldom less than 6 minutes, but frequently much longer due to line stoppages. Pork meat quality can be defined as a combination of different properties of fresh meat. These properties concern both consumer acceptance and technological aspects such as colour, water holding capacity and texture, with pH immediately post mortem being an important factor. The handling of the animals at the abattoir and the resting period (welfare aspects) are suggested to play an important role15,16. Pre-slaughter welfare of the pigs at the abattoir was found to be influenced at the outset by the origin and type of pig slaughtered, the daily throughput range of pigs and the type of abattoir involved. All abattoirs slaughtered a mixture of breeds, but the large specialist pig abattoirs tended to slaughter larger, more uniformly sized pigs, which were generally easier to handle. The multi-species service abattoirs and the smaller specialist pig abattoirs tended to slaughter more routinely a full spectrum of sizes from both intensively and extensively raised pigs and in the main more difficult to handle. A disappointing pre-arrival aspect was the deficiencies in road motor vehicles observed whilst off-loading pigs. No shade cloths were used in 59 % of the vehicles and 50 % of the 14 trailers, and floor cleats, grids or mats were not used in 55 % of the vehicles. Problems were encountered in 75 % of double-deck side offloaders, mainly from the lower deck, and 20 % of single-bed, side off-loaders. 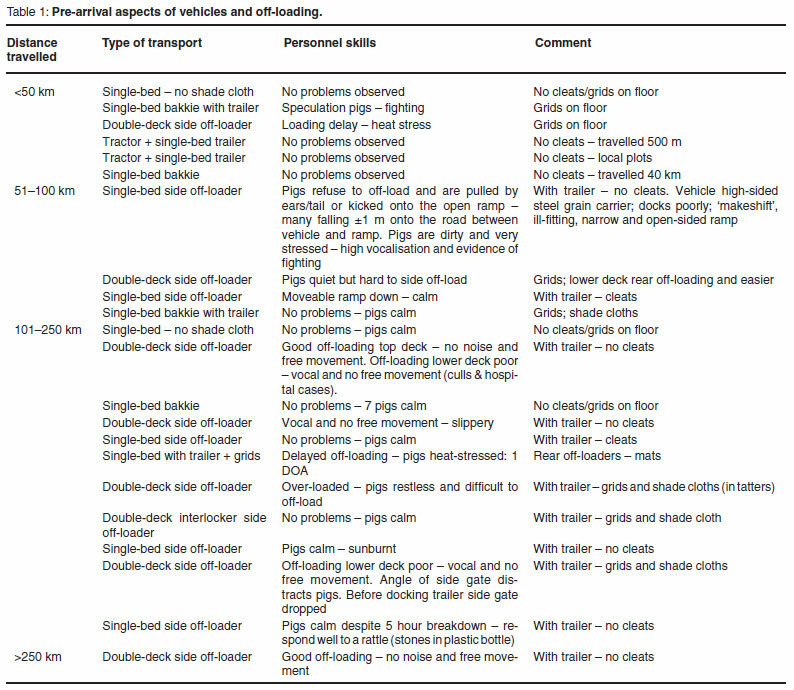 These included poor docking, loading and offloading delays (pig factors and vehicle factors), heat and handling stress factors, with fighting, reluctance to move and high vocalisation. Through poor design or lack of maintenance, another factor that hampered free movement of pigs was the off-loading facilities. Many were unable to adjust to multiple-deck vehicles, were too steep and slippery with or without grids, and had sharp corners and open sided landing areas or ramps. Lairage care aspects must include the management of weather conditions and it was pleasing in summer that the environmental temperature of the lairages was lower than that of the prevailing ambient temperature. This was achieved by lairage design and the use of micro-misting sprayer systems, but without maintenance these created a wet environment and wasted water. One service abattoir and a large speciesspecific abattoir had rectangular pens and passages with an open rail design leading to solid wall races just before the stunning area. In the former, pens were inconsistently sized and designed to fill all the available space with little thought given to lairage flow patterns for filling and emptying pens. In the latter, lairage design was carefully planned with pens of ±18 m2 holding up to 25 bacon pigs. In all the other abattoirs lairages were rectangular box shaped solid walled pens and solid walled passages with blind right-angled turns. Pens were frequently overcrowded and pigs of different sizes were not separated. At 1 abattoir, for example, 70 adult culls (sausage pigs) were spread amongst the other pigs from 8 different suppliers in the lairage, and all had been standing for 2 days in the lairage due to machine down time at stunning. Herding of pigs was achieved using bag whips, making a noise with a rattle or by hand herding. Prodders were, however, noted at strategic points where animal management was difficult. That lairages are not high on the management supervision agenda in most abattoirs is supported by the following observations during 1 of the abattoir visits.  Five dead pigs were found scattered over the lairages - no attempt was made to remove them.  One dead pig was found lying on the rubble outside the passage to the pens from off-loading and 1 downer pig was lying in that passage.  Lairage floors and drainage were very poor. In 3 of the specialised pig abattoirs staff handling efficiency was good, the personnel were trained and sympathetic and training was on-going and monitored. In 1 service abattoir, efficiency was also generally good, but due to design problems with the in-feed to the restraining conveyer, frustration and a tendency not to know how to do it crept in and handling deteriorated. In the other service abattoir, design problems coupled with the variety in type and size of pig slaughtered caused staff to struggle with pre-slaughter handling, and they were clearly untrained, unmonitored, inexperienced, incompetent and inconsiderate. The staff handling inefficiency in the slaughter of adult culls was a disgrace, albeit in the main due to totally inadequate pre-slaughter handling and stunning facilities. The nature of animal behaviour in the pens, in the passages and into the stunning area was directly related to the pig handling efficiency and to the nature and extent of design and maintenance problems with equipment. Where these were faulty, pigs fought, were unwilling to move and had to be forced, with high vocalisation. Pigs were very quiet in the pens in specialised pig abattoirs, offering no resistance and moving freely. However, aroused alarm behaviour was a tendency displayed where the pens were of the open rail design and ina2m long, too narrow, final in-feed to stunning at 1 abattoir. This was in sharp contrast to the ease of movement achieved at the same abattoir using solid walled passages leading into a ½ crowding pen (turn wheel type) prior to the final in-feed. Direct slaughter of pigs (30 min in pens) generally produces fewer carcasses of normal quality (higher incidence of PSE status) than resting periods of up to 2-3 h (lower plasma cortisol levels), irrespective of whether mixed with unfamiliar animals12. A longer resting period before slaughter was found to induce a slightly higher ultimate pH, accompanied by a somewhat darker colour (24 hours post mortem)15. The policy adopted for a stand over time prior to slaughter for the pigs in the lairages in this project has been outlined under results. In 2 species-specific abattoirs the majority were held overnight and any required for slaughter on day of arrival were rested for 2 to 3 hours. If required, pigs were slaughtered directly on arrival with a resting period of 30 minutes or less. This policy was ignored and no consideration was given to exacerbating circumstances (stressors) as identified during visits, for example, hot ambient temperatures (no shade cloths), delays in loading, unsuitable vehicles (high-sided steel grain carrier), breakdowns and delays en route and difficulties in off-loading. No ante mortem inspection was observed, nor was a specific emergency slaughter area or procedure seen during abattoir visits. In this survey of commercial practice in the Highveld Region of South Africa not one of the 6 abattoirs visited had a welldesigned in-feed to a well planned stunning area/facility and a very high level of pig pre-slaughter stress was witnessed in all instances. Stress immediately prior to slaughter affects meat quality much more than stress experienced earlier on and most meat quality parameters were affected significantly by the day of slaughter15. A study demonstrated that plasma lactate concentrations increased with greater ante mortem stress, which progressively elevated pHu in the muscles and tended to reduce eating quality16. Four of the abattoirs surveyed had a restrainer conveyer and 2 fixed size rectangular pens in which stunning took place. In-feed from the lairage passage through a guillotine gate into the latter presented few difficulties, but pig management for stunning at a relatively fixed point was difficult, particularly as the number of pigs decreased and pig preslaughter stress increased as they were chased around the pen. It is essential that the person stunning the pigs controls the movement of the restrainer conveyer. This enables the synchronisation of pigs arriving at the point of stunning to be coordinated with the sticking and shackling functions, and importantly, with the movement of the bleeding line. Stoppages of the line occur for a number of reasons, often merely an unavailability of bleeding chains at sticking, and failure to synchronise has serious welfare implications. The most serious of these are failure to stick and shackle, with pigs falling into the bleeding trough and left there to recover, multiple attempts at stunning pigs outside the conveyer, multiple attempts at sticking an unmanageable pig lying on the roller bed and eventually re-stunning of pigs that had recovered. Welfare implications also arise from problems associated with the disappointing design of the facilities leading up to and into the restrainer conveyer, often linked with space constraints. Disregard for basic design factors frequently impeded the free movement of the pigs and increased staff frustration, physical manhandling and pre-slaughter stress. This was mainly due to too wide/narrow a passage, with too sharp an angle up to the restrainer and too steep with an uncovered floor gap before the restrainer. The researchers are of the opinion that many of the problems associated with the stunning of pigs could be addressed by providing adequate space for this important function and the appropriate use of crowding pens to reduce floor area, thus enhancing and improving pig handling management. No abattoir had operational parameters for stunning displayed on the stunning apparatus or in the stunning area, thus contravening the Red Meat Regulations under the Meat Safety Act (Act 40 of 2000). The condition of the hand held V design stunners was fair to good and in all but 1 abattoir the electrodes were not cleaned while in use. The stunners were purportedly low maintenance and checked/ cleaned weekly, with 1 abattoir reporting daily maintenance. The potential problems with existing systems are that the profile of the pig head precludes the application of existing electrodes in the correct position; the small area of contact enhances carbon build-up, which increases electrical impedance and the electrodes are easily tarnished with few cleaning tools provided 13. One abattoir had a V electrode as back up whilst the others claimed to have at least 1 pair of scissor tongs. In 1 instance, however, the unit controlling the current to the tongs was faulty and without a backup facility the pigs were inadequately stunned for the entire day, during which 100 % missed shock (motor paralysis only) was recorded. One abattoir had an automatic hydraulically operated and computerised copper fiber mace electrode catching pigs on each side on the lateral aspect of head. This high voltage unit (500 V) was checked every day and serviced weekly and the company had scissor tongs as back up. On the 2nd visit, however, a hydraulic leak resulted in an erratic stun pattern with as high as 14 % missed shock. Although delivering a near perfect stun in between, coupled with a 12 % missed shock during the 1st visit, the fact remains that stunning requires constant hands-on supervision/management. This was sadly lacking in all the abattoirs visited. For the current details of stunning induction the researchers were informed that the amperage ranged from 0.5 to 1.6 other than for the high voltage automated stunner at 500 V, where 15 amps were generated for a very short time. The low voltage used in the other abattoirs ranged from 90 to 230 V. A survey of commercial practice in the United Kingdom showed that many pigs failed to receive enough current and were therefore ineffectively stunned3,17. For pigs the current is either a minimum of 0.41 amps if the electrodes are placed in the optimal position8 or 1.3 amps if placed in the least optimal position7,17. The minimum EC requirement is a current of 1.25-1.3 amps maintained for at least 3 seconds at a high voltage of at least 240 V.
The terminal (electrode) placement was mainly good, spanning the brain below the ear on each side of the head and stun duration varied according to size, ranging between 2 and 15 seconds. The optimum position of the electrodes is virtually impossible to attain under practical conditions8 and in the routine stunning of pigs the practice of repeat application of electrical stunning is common9.In support of this statement, repeat stunning was recorded in all 6 of the abattoirs visited (9 % of the total sample size n = 1175). Repeat stunning can produce successive epileptic activity and therefore an effective stun, with a significantly shorter duration of tonic and clonic phase activity. However, reflexes returned more quickly following repeat application as the tonic and clonic muscle cramps were impaired and the practice must be discouraged. Animals subjected to 2 stuns have been starved of their aerobic energy supply and may be less able to sustain physical activity than animals subjected to a single stun9. High frequency stunning produced epilepsy and unconsciousness and appeared therefore to be acceptable from an animal welfare standpoint. The average stunning to sticking interval was shorter with high frequency stunning compared with 50 Hz stunning4. 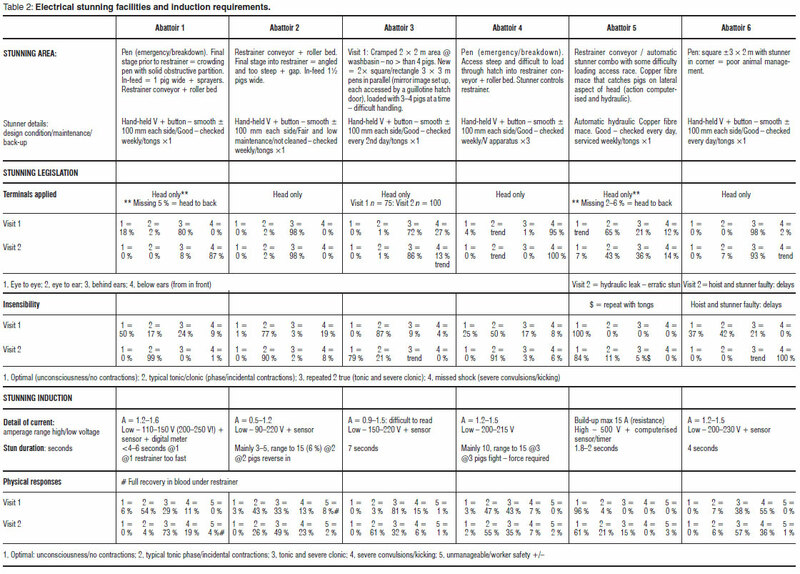 It has been shown that if the stunning-tosticking interval is longer than 15 s, the chances of recovery are increased5. Poorly performed, variable and disappointing shackling of pigs, mainly in the 2 service abattoirs, contributed to unnecessary delays between stunning and sticking. On analysis of the total sample size over 2 visits per abattoir (n = 1175) it transpires that 66 % were easy to shackle with a minimum of delay, but that 34 % were difficult to shackle, 90 % of these being from the abattoirs tending to slaughter more routinely a wide range of different sized pigs. Of these, 34 % required physical control (usually a foot placed firmly on the abdomen) and 6 % were impossible to handle and contributed mainly to the small percentage that fell into and recovered in the bleeding troughs. In this survey 149 pigs or 13 % required more than a single sticking attempt to bleed out properly, considerably higher than published reports, although carcass convulsions were regarded as being excessive in only 4 % of cases. An abattoir survey of pig stunning and slaughter found variations in the methods and effectiveness of sticking, with 2.3 % of pigs requiring a second attempt to bleed out properly1. This was attributed to the intensity of convulsions on sticking and the experience and care of the operative in charge of the slaughter procedure. The results of this study indicate that following head-only electrical stunning, a relatively long sticking wound by a thoracic cut should result in humane slaughter and provide better welfare in slaughter pigs, but would result in carcass contamination by microorganisms present in the scalding water and pose a threat to public health1. In the present survey 67 % of the pigs were stuck to bleed through a medium to large sticking wound by a thoracic cut. In conclusion, how then were the research questions addressed? It is essentially the poor pre-slaughter handling facilities rather than the stunning apparatus design that increased pre-slaughter handling stress, potentially affecting the magnitude of the current flow, thus impeding the performance of the stunning system13. Both were major contributory factors in the absence of pre-slaughter handling management, and lack of supervision over the good state of repair of the electrical stunning apparatus and allied facilities (hoists). The frequent failure in some abattoirs to use the stunning apparatus in accordance with approved methods shows a misunderstanding of the stunning induction requirements and the importance of achieving a good stun11. Where abattoirs slaughtered a more uniform-sized pig the frequency of stunning producing epilepsy and unconsciousness and the time interval before and the technique of the sticking method tended to be more acceptable from an animal welfare standpoint4. This was not true where the abattoir tended to slaughter more routinely a full spectrum of sizes from both intensively and extensively raised pigs. It would appear that high voltage electrical stunning with a short stunning time and a minimal lapse of time between stunning and sticking, does offer the best prospects in relation to pork quality14.